How to Make a Human‘s epilogue explores a handful of works willing to risk all by abandoning humanism: the tradition of the15 Signs of the Last Days; a lost oxen story from Paulinus of Nola; a holy horse carcass from Folcuin of St. Bertin’s portion of the Deeds of the Abbots of Saint Bertin; and a middle bit from Sir Gowther. My next book will pick up where the first left off by concentrating on medieval works that imagine what it might mean to give up on human dominance. None of the works I’ll examine in Book Two salves a nervous human conscience; all offer a way out of humanism, but at the price, not of humiliation, precisely, but of something far riskier than humbleness. Surely there are other texts I could look at. But I’m a medievalist, so I’m writing about medieval texts. If you were to suggest that I might learn to write about something else, I’d pack my ears loosely with garlic and flee. Less glibly, I’d say that I’m interested in the outliers to a textual climate almost universally committed to human supremacy. I’m interested in texts that at least propose to leave off human supremacy, even though so much—salvation, most notably—is at stake. Here’s an outline, like the whole project, tentatively proposed. Following the introduction (duh), there will be three chapters: on pets; on feral children; and on worms and corpses. The conclusion will possibly develop the essay on fish knights I wrote with Peggy McCracken (incidentally, Peggy M. and Sharon Kinoshita have just come out with a book on Marie de France: well worth using). I hope to do Book Two in 65-80K words, that is, about 50-65K fewer words than How to Make a Human. All three chapters will have been published in some form by the time the book appears, as 2,000 words (dead pets), 7500 (feral children), and 5600 (worms). The book will allow each chapter to be the length it wants to be, likely 15-20K each, with another 20-25K words available for the intro and conclusion. In more detail, the DEAD PETS chapter will revisit Cary Wolfe and Jonathan Elmer’s old notion of the “Logic of the Pet” to see what affect and habit can do. No surprise, Haraway will be important here, but I imagine I’m going to turn up a host of other pet research once I start digging; as for affect, I barely have any idea where to begin: Fradenburg? Bersani? The chapter will start with Yvain’s lion, if only because everyone’s always asking me about it; then (maybe?) look at Bevis of Hampton’s horse, Arondel; and conclude with a Middle English version of the canis legend (you know, the story of the dog, the baby, the snake, and an impetuous knight) in which the knight, mad with grief and guilt, drowns himself. I’ll be happy to talk about other animal companions, if you have any on hand. Next day edit: rather than talk about Arondel, I think I’ll do a pocket history of medieval pets and pet love, to set up the dogs story: I have material already on hand on Chaucer’s Prioress; likewise Tristan’s dog; and I can build on large body of already existing work on medieval hunting dogs. The FERAL CHILD chapter will, in effect, follow humans out into the wild, by starting with another version of the canis legend in which the grieving knight does just that. If you’ve already read AVMEO, you know some of what I’ll do here: my primary text will be the story of the Wolf Child of Hesse, from the Chronicle of the Benedictine Monastery of Saint Peter of Erfurt, although I plan to provide a pocket history of medieval and early modern feral children. Where chapter one centered on affect (how we’re remapped by feeling, even to the point of suicide), chapter two will center on feeding and, in a larger sense, action, as in: what can we do when we can’t let humanism guide us anymore? What might it look to eat without the confidence of doing the right thing, without the protection of a good conscience? My philosophical guides will be the ethical quandaries raised by Derrida’s meditations on eating, and especially those of object-oriented philosophy and other new materialisms, for example, Ian Bogost’s section on metaphorism in Alien Phenomenology and, I suspect, Karen Barad’s (gigantic!) Meeting the Universe Halfway. I might even be able to squeeze in an appreciation of the brilliant (Not) Tilda Swinton twitter account. Likely I’ll have to look at wilder manifestos on ethical eating. The WORMS chapter turns from eating to being eaten. Having started with affect, and moved on to behavior, I’ll be finishing with matter, with the flux of things that goes on, indifferent to our feelings or actions. 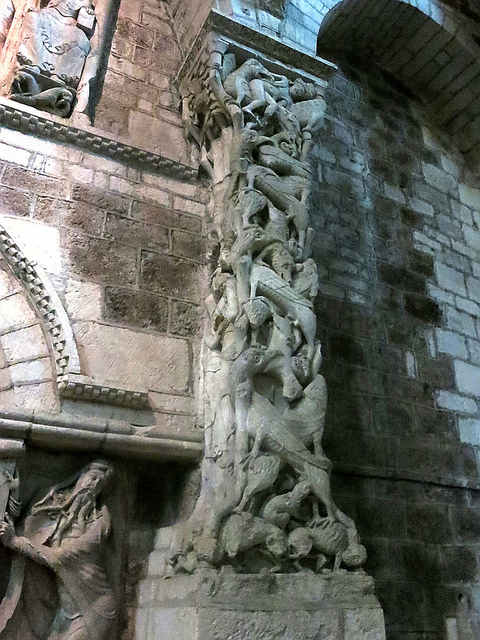 I’ll start by discussing a famous column from the Abbey of St. Marie in Souillac (see image above: for the whole flickr set from my visit, see here). My primary texts, however, will be medieval death art, particularly the Disputation Between the Body and Worms and its illustrations, from that well-studied Carthusian miscellany, British Library Add. 37049. Perversely, maybe, my reading of this pious material will be profane, not so much indifferent to its proper spiritual context but rather open to a more expansive sense of context than usual. I’ll be conceptualizing the flux of matter as eating, and my guiding philosophical points might be the ‘consumptive’ element in Graham Harman’s key examples, namely, the cotton and the fire and sucking tubes. The FISH KNIGHTS strike me as a good place to leave off, because this weird episode from the Roman de Perceforest raises all the questions the book will have posed by this point: what happens when we come to love and admire the nonhuman; what happens when we’re not sure we’re eating the right thing; and what happens when we’re no longer so sure about divisions between life and nonlife and organic and inorganic. I’ll likely finish with points inspired by Eileen’s AVMEO essay, viz., that in a material world, self-effacement is not an option, even if we try to do without the comfort of self-justification. We have to be somewhere; and we’ve already had a decision made for us to take up someone else’s place, even if that place we occupy is always enmeshed in a world of other shifting agents, each with its own agenda (readers of The Ecological Thought might hear a friendly argument brewing). My tasks are as follows: to read more deeply in ecocriticism, particularly in its more misanthropic veins. I’ll want, as well, to read more versions of the canis legend (I’ve done 22 so far, and have about another 100 to go); to determine if more manuscripts of the Erfurt chronicle have turned up since the MGH published its edition 113 years ago; and, especially, I’ll want somehow to avoid my own work’s universalizing tendencies. I’d especially like to try to pay more than lip service to gender. The canis legend tends to be terrifically misogynist; and the Disputation smugly inflicts putrefaction on a beautiful woman with as mean a spirit as we see in, say, The Testament of Cresseid. I need to do something with this, but right now I’m not seeing how to get this done in a project with such a posthuman trajectory. Even Stacy Alaimo’s Bodily Natures –a great book for showing us how to do a feminist materialist criticism–mostly concerns humans, even if she conceptualizes the human in a way radically different from the traditionally bounded, denatured (neo)liberal humanist subject. Wish me luck! And please give me suggestions or warnings. I’m not the fastest writer in our world, so there’s still time for you to intervene.